Investments pour in as companies race to commercialize new communications technology. We have been spending considerable time and effort with our customers deep in the development of technology that will enable next-generation communications. Work on 5G technology has been underway for several years now-long before the general public will experience its amazing capabilities. So when will this next-generation technology be ready? You’ll get a first look next month at the Winter Olympics in PyeongChang, South Korea. In addition to the athletic competition, this event will provide one of the first large-scale demonstrations of next-generation wireless media access thanks to 5G. Collaborators Intel and Korea Telecom (KT), with support from global equipment makers and chipmakers such as Samsung, LG, Nokia, Ericsson, ZTE, Qualcomm, Huawei, and others, will showcase select services to enhance the viewing experience with special networks set up in Gangneung Olympic Park, Gwanghwamoon, Seoul, and at other Olympic venues across Korea. Sync View – Transmits super-high-quality video in real time using an ultra-small camera, position sensor, and mobile communication module, enabling viewers to watch the games from the perspective of the players. Interactive Time Slice – All 100 cameras installed at different angles will shoot what’s happening, letting viewers interactively choose the screen and angle they want to watch. 360° VR Live – Events will be captured and streamed by 360-degree cameras and using head-mounted display (HMD) equipment that offers virtual reality (VR) live views of virtually every place in the arena. Omni Point View – Presents the event in virtual 3D space, enabling spectators to enjoy 3D virtual view from the perspectives of the player of their choice or at specific points they want on mobile devices in real time. These features will provide the world with a first glimpse into the capabilities enabled by 5G breakthroughs. Interactive view-slicing viewing will allow users to zoom in on skaters in the indoor arena and rotate the image, similar to visual effects encountered in movies such as The Matrix. To enable this feature, servers will pull images from a hundred cameras lining the arena, reconstituting them in real time to create a customizable view for each subscriber. The ability to spin a skater through 360 degrees in high definition requires that the system be able to deliver 400 megabytes per second, according to HongBeom Jeon, executive vice president at Korea Telecom. On the ski courses, the omni point system will let viewers track the progress of competitors with skiers wearing a GPS receiver to pass their location live to the KT servers. The GPS information will be synchronized with images pulled from cameras around the course and the servers will then synthesize the view seen by the competitors in real-time. KT has fitted the cameras with wireless transceivers to connect them in real time, pushing the low latency requirements called for in the 5G specification. Other events also will provide an immersive user experience with a live view, such as on the bobsled course, thanks to wireless cameras located in the bobsled cockpit. 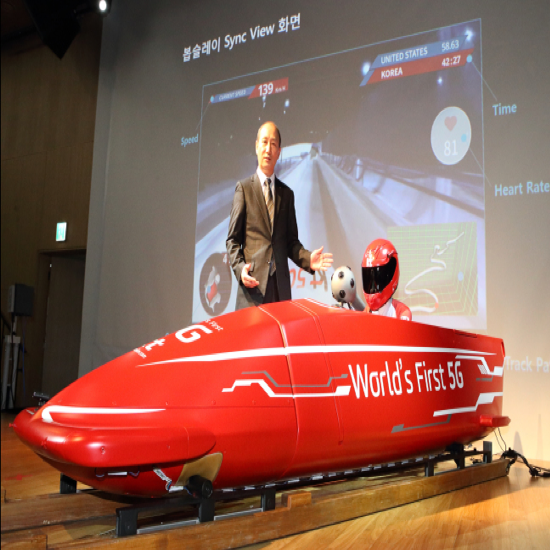 Given that bobsleds travel at speeds of up to 153 kilometers per hour, it is often difficult to connect them to a wireless network. However, KT has developed a new network frame suitable for fast speed environments,” remarked a company official. Figure 1. Oh Sung-mok, vice president of KT’s network division, introduces new services running on 5G networks during a press conference in Seoul. In addition, 5G technology will support drones equipped with video cameras. During a technical trial last September, images were sent from the top of a ski jump tower, and on the subsequent route, down to ground level, providing an alternative method to capture the athlete’s point of view and beyond. 5G and drones are also teaming up for autonomous drone delivery services. Other 5G-enabled experiences include the mixed-reality (MR) Olympic torch relay and VR walkthrough. With mobile communications, the Olympic flame lit in Greece will travel to Pyeongchang via mobile phone as a virtual image, then on to a real torch, and then back to another torchbearer in the virtual space. 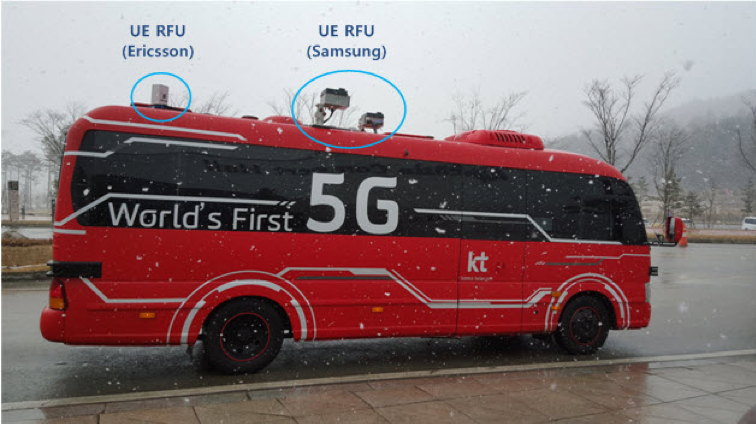 In an earlier limited test, KT engineers deployed three base stations in the center of Seoul that communicated with buses fitted with 28 GHz transceivers for autonomous driving. Of the three sites, two non-mobile cell sites supported 4-sector and 2-sector, respectively, while the third mobile site was equipped with a 5G base station and antenna that supported 2-sector. The bus was equipped with 5G devices by Samsung and Ericsson. The 5G base station and devices used an operating frequency band of 28 GHz capable of supporting maximum data rates of up to 20 Gbps per cell and 3.2 Gbps per device. Figure 2. KT 5G autonomous driving bus. Following the success of this test, KT has installed the equipment at Daegwallyeong Tunnels, which consists of six tunnels along Expressway 50, in order to provide services for drivers starting next month. Visitors to the games can use the telecom operator’s self-driving 5G bus to move between skiing events around the resort. The bus will have screens inside to display the multimedia demonstrations, some using 3D display technologies. Achieving this capability remains a challenge. Even with the three base stations arranged around Seoul’s central boulevard, KT found the signal strength to and from the bus varied much more than with LTE, with the biggest drops often occurring as the bus turned a corner. This represents one of the major obstacles of implementing 5G and its use of millimeter-wave (mmWave) spectrum in the real world. For the development of the new 5G systems operating up to 100 GHz, there is a need for accurate radio propagation models, an area that NI AWR Design Environment, specifically Visual System Simulator (VSS) addresses with channel models that are continually being enhanced to keep pace with the latest advances in technology. Antenna system directivity of high-frequency communications has a key advantage for mobile operators when it comes to delivering gigabits per second to many users in a cell. With beam steering, a base station can direct more energy at individual users instead of dividing up transmissions into tiny packets that are allocated in round-robin fashion to receivers. But beamforming, and other techniques such as Massive multiple-in-multiple-out (MIMO), rely on multiple antennas and the application of high-performance digital signal processing (DSP). Due to reflections from buildings in an urban environment, it is not possible to serve multiple users continuously with a single base station. This is where densification of the network will come into play. Base-stations will need to cooperate so that if there is no path to a user, another one that is in range can take over. Another challenge with RF communications in the mmWave spectrum is that the waves propagate more like optical energy than radio waves. If the energy is sent in the wrong direction, the receiver will receive practically nothing. Seoul will be a great proving ground for working out these issues on a grand scale. KT executives have publicly discussed their 5G deployment plans, which initially will make use of 28 GHz for hotspot urban and 3.5 GHz for urban and rural areas. Through the utilization of these spectrum, KT will be in a position to cover a wide range of use cases such as 4K/8K cameras, remote medical services, drones, and public service during the Games. Deployment will be expanded to support smart cities, smart factories, and other new infrastructure projects in the near future. Tech specialists at the Boston Consulting Group estimated in a recent report that mobile companies would have to spend $4 trillion (3.6 trillion euros) on research and investments by 2020 to develop 5G. South Korea alone has invested $1.6 billion aiming to commercialize 5G technology by 2020, according to the GSMA. One advantage operators have in deploying 5G early is the potential to use mmWave spectrum to support the infrastructure needed to deploy smaller, lower frequency base stations into dense urban areas more economically. The self-backhaul approach feeds data received on sub-6 GHz bands onto broadband mmWave links between base stations. This overcomes the problem that early mmWave systems are likely to have in dealing with mobile users and eliminates the costly need to lay down fiber networks for backhaul support of a network containing a high number of base stations. Figure 3. 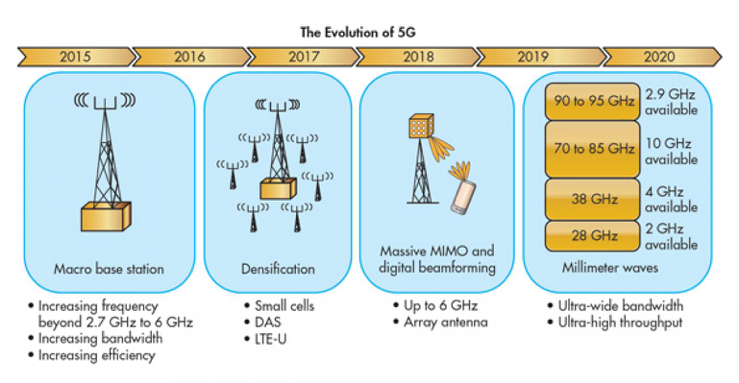 Evolving technologies that will support future 5G networks. We will be discussing more about this topic and related features in the next NI AWR Design Environment product release and in future technical articles, white papers, workshops, and webinars throughout 2018. In the meantime, learn more about 5G communications design through our recent articles on 5G power amplifier design, 5G filter design, mmWave phased-array automobile radar, and simulation of system metrics for 5G-all available in the NI AWR software resource library.